We investigate the voter registration of faculty at 40 leading U.S. universities in the fields of Economics, History, Journalism/Communications, Law, and Psychology. We looked up 7,243 professors and found 3,623 to be registered Democratic and 314 Republican, for an overall D:R ratio of 11.5:1. 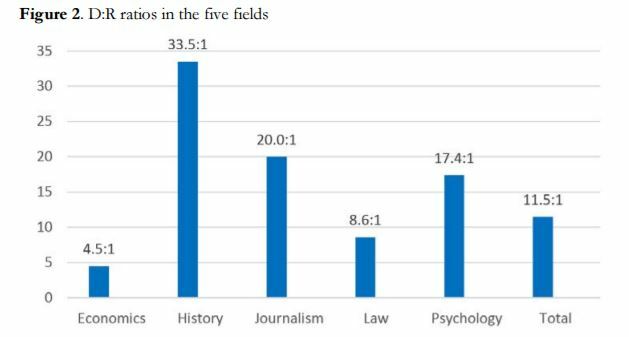 The D:R ratios for the five fields were: Economics 4.5:1, History 33.5:1, Journalism/Communications 20.0:1, Law 8.6:1, and Psychology 17.4:1. The results indicate that D:R ratios have increased since 2004, and the age profile suggests that in the future they will be even higher. We provide a breakdown by department at each university. The data support the established finding that D:R ratios are highest at the apex of disciplinary pyramids, that is, at the most prestigious departments. We also examine how D:R ratios vary by gender and by region. People interested in ideological diversity or concerned about the errors of leftist outlooks—including students, parents, donors, and taxpayers—might find our results deeply troubling. Langbert, Quain, Klein, 2016, pg. 425. Of course, this is nothing new. For example, Jonathan Haidt and colleagues recently highlighted the lack of political diversity in academic psychology. What’s particularly interesting to me, however, is the D:R ratio in economics. I recall a Facebook discussion toward the end of last year in which this bias was downplayed and economic departments were more-or-less given as examples of conservative (read Republican) hubs on campus.1 I already knew this wasn’t true and said as much, but my comment was pretty much ignored. This exchange made me realize that many outsiders likely think mainstream economics is tainted by an American brand of conservatism.2 But more important, it made me realize that some (many?) on the left reject the findings of mainstream economics because they think it’s politically biased. So, to those who think economic departments are full of conservatives: yes, these departments are more conservative than others. But the only way they could be labeled “conservative” is due to other departments being so far to the left. Basically, econ departments are more politically diverse. Nonetheless, they are still dominated by Democrats. While this may not instill confidence in my Republican friends, perhaps it will convert some of my Democrat ones. It seems more that the definition of R has contracted and the definition of D has expanded. Neither party is a monolith in belief. Currently, Democrats are in flux as to what they believe and how to get there. The study doesn’t seem to show a lack of diversity in beliefs, but lack of diversity in the labels being used. Of course neither party is a monolith of belief. One could argue that parties are in flux most of the time with each new generation. But the claim that it’s just a lack of diversity in “the labels being used” and not in beliefs strikes me as a massive stretch. People have particular political beliefs that lead them to identify with a particular party and vote a particular way. They believe enough the same way about politics that they choose to register with a specific party. Funding for universities has largely come from the Democrats, and professors have largely supported the Democrats as the Republicans have increasingly become budget hawks. That has been especially true following the Reagan years. In the days of Tammany Hall, when the Democrats were often fiscal conservatives, there was much greater partisan diversity on campus. If you go back to the 19th century, the colleges were Federalist then Whig. In those days Federalists/Whigs/Republicans tended to support the colleges. The Morrill Land Grant Act was Republican, and Republicans in the North continued to dominate the elite colleges until the 1930s. That changed in the 1930s. As Christopher Loss points out in “Between Citizens and State,” the Roosevelt administration heavily subsidized colleges. Loss describes how agricultural sciences programs were directly funded to advocate Democratic, New Deal ideology. My own college, Brooklyn College, received the funds for its campus from a New Deal grant. Thus, party drives ideology rather than the reverse. The current trend toward Democratic exclusivity began with the financial support that Democrats gave to universities in the New Deal era. The increasingly radical, intolerant atmosphere in colleges escalated with the radicalization within the Democratic Party after the 1972 presidential election. Colleges are Democratic Party publicity operations. The more radical, intolerant Democrats who dominate campuses today (in comparison with the 1960s) reflect the Democratic Party itself. They are in effect funded by Democrats to advocate Democratic positions. The biggest joke on campus is the claim that there is such a thing as academic freedom for anyone other than Democrats. The joke is that today’s Democrats hire other Democrats at a rate comparable to the racists of the 1930s having hired whites only. There is academic freedom because only Democrats are hired. Ha, ha. “They have the Hoover Institution at Stanford!” apparently counts as evidence that bias doesn’t exist. Nevermind that modern Republicans are virtually mercantilists: an economic theory that was refuted in the 18th century.